When I moved out to Colorado, I quickly realized that fishing was just not the same. 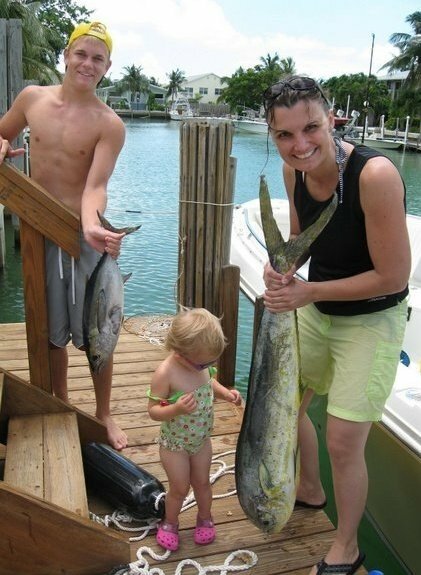 Back in Florida, the bigger the bait, and the bigger the catch. Here in Colorado, anything larger than a goldfish scares half the fish away. Even when I brought the size of the bait down to 'norm' the catch was under-whelming. A sixteen-inch trout is a 'trophy' to anglers out here, while back in Florida, this was the average size used for trolling for Dolphin fish (Mahi). Obviously, I had to make some adjustments if I wanted to enjoy my life long hobby. This is where fly-fishing came in. Seemed simple, toss this little fly out on a river and wait for the trout to bite. The trout would have a fighting chance before meeting my frying pan. After hooking my dog in the nose, I began to realize there's a lot more to this "fly fishing" thing than meets the eye. Besides using the correct fly for the river and time of year, you also need to know how to fling a 9 foot pole back and forth, tossing this weightless fly into an area about 6 inches in diameter. And you think trading stocks is frustrating! Over time, I began to get a feel for this fly fishing thing. Casts became easy; reading the hatch (picking the correct fly) became effortless. To the chagrin of other anglers on the river, I could step onto it and have a rod screaming in minutes. Trading stocks is like fishing. You're on the hunt, trying to catch the biggest fish for any given day. This is where process comes into play. If you're constantly casting in the wrong place, you will never catch any fish. For trading stocks, the process is simple. We've had people pave the path for us. We need to fish in the area with the biggest fish. This is where our relative strength scan comes into play. Using Bluefin we can find the stocks with the highest relative strength in the strongest sectors. These are the best performing stocks and can offer the largest reward. Once we've identified our pool to fish, we need to figure out how to cast to that pool. When I took some casting lessons, the instructor kept saying 11 o'clock and 1 o'clock. Every time we went out, over and over I would hear 11 O'clock and 1'Oclock referring to the position of my rod. Eventually, it became second nature. Now, I cast effortlessly to most spots. If you're a StockBee member, you hear this same thing with trading setups. "It went up, sideways, then it breaks out" and this is where you want to buy. When you've traded this setup a thousand times, it becomes second nature. You do not have to think about it, you just react and WHAM, the next thing you know you just landed a keeper. Another piece of the puzzle is actually landing the fish. How many times have you seen someone with a huge fish on their rod, but the drag was too tight and SNAP, off it goes into oblivion? You can think of your drag as how you mange that stock once you're in it. The tighter the stop the more likely the fish will get off. The looser you have that stop, the more likely the fish will never get in. This is where process comes into play. By defining how you manage a stock from entry to exit is how you will make progress in trading. By logging this information, over time you can look back on your trading history and tweak and refine your trading process. Eventually, this process becomes second nature to you; it's not tedious but just part of your routine. With trading you need to be able to read the water, make the cast, and then reel in the reward. This all involves defining a process and sticking to your plan. Then you can look back and refine this process so you can be successful in each new cast you make. Nice article. Enjoyable reading yet contains very important points. Thank you.